This Cannellini Bean Yam Hummus is one of my favorite recipes from Vive le Vegan! It's been a while since I've made this dip, and also a while since I've done a cooking segment for Erik's Diner. Here, we have both! On Erik Marcus's podcast today, I have a short piece (~5 mins) on making this hummus. I briefly explain the ingredients, give a few tips, and describe how to make this easy, tasty dip. I would actually rename this recipe if I could, because the name doesn't accurately describe what this dip is. It's not really a hummus. It's more of a smoky-sweet bean dip that combines cannellini beans with baked yam (orange sweet potato for some of you), Tabasco chipotle hot sauce, toasted pine nuts, fresh lime or lemon juice, and a few other seasonings. I use a small amount of the chipotle hot sauce which gives this dip a smoky flavor, rather than a spicy 'heat'. This combines very well with the sweetness of the yam, the creaminess of the cannellini beans, and the earthy tone of the toasted pine nuts. Try this recipe for your next party or picnic, serving it with pita breads, tortilla chips, or a sliced baguette. It's proven to be a hit at parties when I make it, and it's very different from other hummus and bean dips you have tried! p.s. After publishing this post, Vicki commented that she also made this hummus! Funny, and once again... I like her picture better than mine! Dreena, this looks awesome. I made your Simple Cider last night and that was an A+. I've never tried this recipe. Now I must! I've never tried it either... you've peaked my interest! TEV... darn! 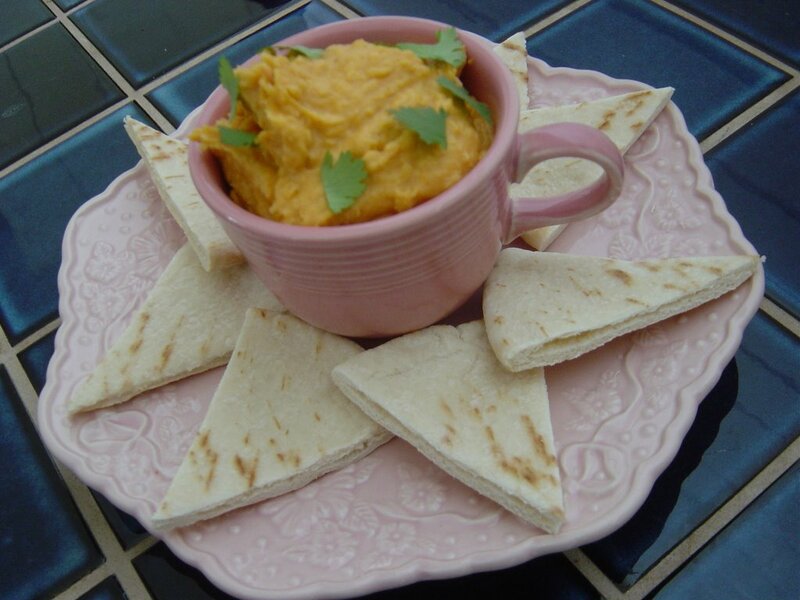 I positively adore sweet potato (or yam, as you call it) and I can not get enough of dips. Plus, this looks totally amazing! One day (*sighs*) I'll get my hands on a copy of Vive and try it. I just listened to the podcast. I love your Canadian accent. Now I cannot wait to try this dip. I have to try and locate some chipotle sauce now. I'm guessing since it's by Tabasco, it will be in my regular grocery store. Hi Leslie, thanks! That vinaigrette reminds me of my pregnancy SO much. I really craved a very 'vinegar-y' salad dressing, and so I came up with that recipe. It had to be simple, and fairly sour, and I think it is more sour than some of my other vinaigrettes. Hi freedom... patience is a virtue, as they say (and my mom certainly said so - over and over)! :) They may order it in if you ask them, worth a try! Hi Starla. It's so funny, because I think I have a "newfie" accent, which is very different from how most Canadians sound. I have a funny mix I guess!! Re the chipotle, yes, you can find it in your grocery store - that's where I get it. No specialty stores needed, just in the aisle with other Tabasco hot sauce. It's quite good, you need just a little, then keep in the fridge and you can add it to burritos, soups, taco fillings, etc. It's great!! I found two good yams today and quickly purchased them. How many does your recipe call for again? I don't have it right infront of me. Also, has anyone seen Kai? I just went to her blog and there was another one in its place...it said Mackenzie Evans or something...talked about Willie Nelson. Hope everything is okay with everyone! This looks scrumptious! I recently tried hummus, and I would have really liked it, except it was really bland(because it was original flavor) but I really want to try this! Also, I have another one of my "random" questions: Is cocoa vegan or all natural? I think I might have cocoa and chocolate confused(well I know the difference, but not really in the vegan facts) I know most chocolate isnt vegan, but is cocoa?? Hi Harmonia! I'm just getting back to you - been a helluva day!! (I'll have more to say about THAT tomorrow!) You need just one yam/sweet potato for this recipe, unless they are very small then probably two. Recipe uses 3/4 cup cooked yam. That thing with Kai's blog was bizarre... I still don't get what happened there. Hi Savanna... well, this dip certainly isn't bland so if it's flavor you want, this one's got it (though it's not spicy hot). I'm fairly certain there is no issue with cocoa powder being vegan. Have never heard of any such thing. As for chocolate, yes, it can (and most often does) include some form of dairy. You really need to look closely at the labels to ensure there is no "milk ingredients" or "butterfat" or anything else dairy-based in there. Hope that helps. Oh, and ditto for hot chocolate or hot cocoa. Even labels stating "dark chocolate" on hot cocoa or chocolate bars, the product may still have dairy. 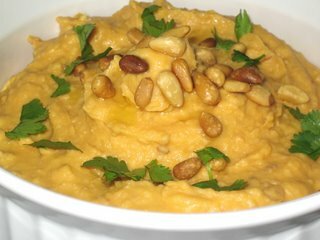 I know this is an old post (and I'm not sure if you'll see this), but I was wondering if you have ever tried making this with squash in lieu of yams?